Why do we play video games? That question and many more, tackled on today’s episode of Kotaku Splitscreen. First, Kirk and I break down the news of the week before getting into some nitty-gritty about what we’ve been playing (25:48), including Civilization VI, Dragon Quest Builders, and Into The Breach. Why do we play games, anyway? LET’S FIGURE IT OUT. Then we talk about the Olympics, whether it’s OK to be friends with Nazis, and all sorts of other good stuff (51:47). Jason: I was thinking about Civ 6, cause I’ve been playing a lot of it with the new expansion, sitting there clicking away and making decisions. I was thinking about that Sid Meier quote, which is something like, “a video game is a series of interesting decisions,” which is at the core of every Civilization game and a lot of strategy games, like Into The Breach is basically that, a series of interesting decisions. Jason: Yes, you’re just constantly making these interesting decisions. So I was thinking about that, and then I was thinking about other games I’m playing, which are not series of interesting decisions. Like I’m playing Rise of the Tomb Raider, and that is not a series of interesting decisions—it’s more of a flow game, where I’m walking around and enjoying the story. Jason: No, not an interesting decision. And then I was thinking about JRPGs, which I play a lot, although I’ve played some JRPGs recently that I did not like, like the Secret of Mana remake... I was thinking about how in JRPGs, you’re playing them not because of interesting decisions but because you’re going along with the groove of the music, the tone, the themes, the story. So all this came together, and it got me thinking that when we talk about video games, we’re talking about so many different things that it almost feels like it hurts the discourse or makes it harder to have real conversations about video games because so many different genres are trying to accomplish so many different things... I almost feel like we should start an organization where we separate games into genres and insist that they all be treated as different mediums. The strategy games, the flow games, the rhythm games. We should have different review sites for all of them. Kirk: [Kidding] That sounds like a great and super doable idea that we should get right on top of. ... One of the big problems is that because people play games in different ways, a different game can be a different thing to a different person, which makes it hard to categorize a game. Because one person’s timewaster might be another person’s focused strategy game. You can play games in a lot of different ways, and get different things out of them... It goes back to that thing we’ve said many times, which is that video games are so varied and different and all-changing, that the more video games develop, the harder it is to have something to say about every type of game. Jason: So I wasn’t serious, obviously, about wanting to classify— but I do think as a thought experiment, the next time you play a video game, think about why you’re playing it, what kinds of decisions you’re making, what your thought process is like going into it. I think that can help you appreciate a game more. 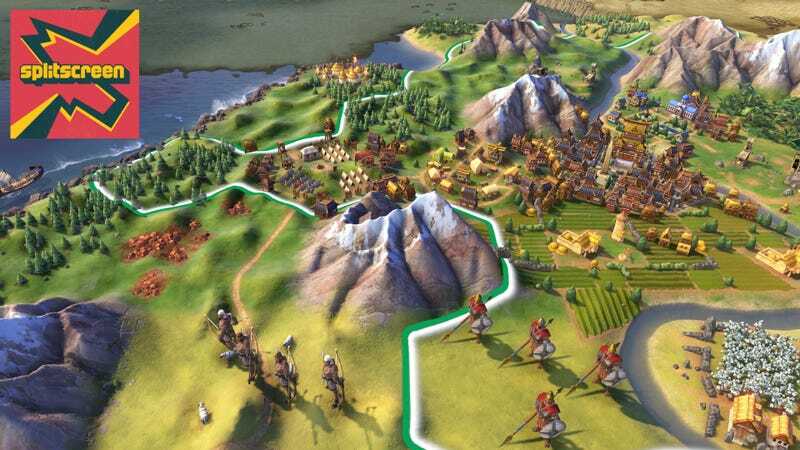 So to get specific on Civ 6, I’ve just been zooming out and playing it and thinking about the idea of, you’re constructing this grand civilization and making all of these decisions, micro and macro, trying to accomplish your goals: exploring, expanding, making everyone happy, building amenities, building all these districts. It’s a cool feeling to be in this world where you are challenging yourself to make smart decisions, and there’s a great deal of satisfaction when you accomplish those goals and know you did it by executing on all those decisions.